Nvidia Corporation had never intended to become involved with the crypto market, Nvidia founder and CEO Jensen Huang said Monday. 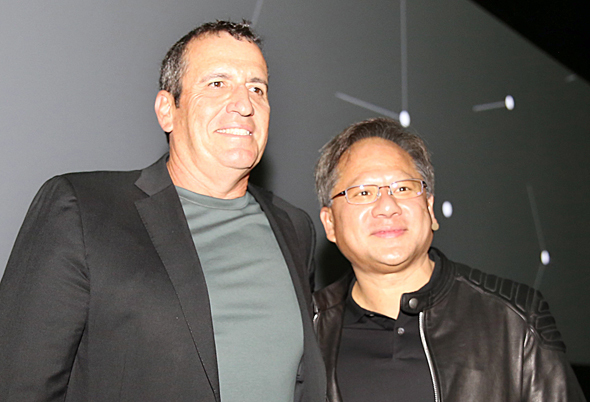 Speaking at a Tel Aviv press conference alongside Mellanox CEO Eyal Waldman, Huang described Nvidia’s tenuous relations with the crypto industry, until recently a major customer of Nvidia chips. “Cryptocurrency is something that found us, and it is in our past,” Huang said. Nvidia’s stock has been hit hard in recent months by the weakening demand for commercial grade GPUs in the crypto market. Between the start of October and the end of 2018, Nvidia’s stock fell by 56%, reaching a low point of $127 per share. In November, the stock took a double-digit hit in a single day when the company slashed its revenue forecasts for the fourth quarter of 2018 by almost $1 billion. “I believe that cryptocurrency has a place. I hope that it will find different algorithms that are a little bit less computationally intensive, and maybe they won’t need our GPUs in the future, but I do believe cryptocurrency has a place,” Huang said. On March 11, Nvidia announced it had agreed to acquire Israeli interconnect chips company Technologies Ltd. for $6.9 billion. The acquisition is still subject to regulatory approvals. Since the announcement, Nvidia saw its stock rise by around 6.5%, while Mellanox’s stock has been relatively stable, keeping the company at a little under $118 per share—below Nvidia’s $125 per share acquisition price. Mellanox has seen an almost 80% rise since first reports of its potential acquisition surfaced in late October. Commenting on the Nvidia’s stock price hike, Huang said the market shows appreciation for the synergies between the companies. On Tuesday, Huang was a keynote speaker at a Calcalist conference held in Tel Aviv. Below is the transcript of the press conference, edited for clarity and brevity. While coming nearly last in order at the event, Huang’s comments on the cryptocurrency industry were placed first. Jensen Huang: We never had plans for cryptocurrency. The reason cryptocurrency found us is because we create this processor—it’s called accelerated computing, it is, in fact, the world’s largest network of supercomputers. And it is all over the world in people’s PCs, many of which are gamers, some of which are research engineers. Essentially, they are these large supercomputers in this large, distributed network. Cryptocurrency found us because cryptocurrency was designed for distributed control of currencies. The demand for cryptocurrency was so great, we over-shipped several quarters ago, and then in the last quarter we under-shipped because there was too much product in the channel. We expect that by April all of the old inventory will be gone. Largely, we expect it to be on track, and then we’ll go back to shipping again. The market is just fine, and now we are under shipping to the market. We’ll recover very nicely. Cryptocurrency is something that found us and it is in our past. I believe that cryptocurrency has a place. I hope that it will find different algorithms that are a little bit less computationally intensive, and maybe they won’t need our GPUs in the future, but I do believe cryptocurrency has a place. Eyal Waldman: On March 11, we announced that both boards have approved Nvidia’s acquisition of Mellanox. We’ve been working together for many years, and this is kind of the climax of getting the two teams, the two technologies and strategies together. We very much appreciate Jensen and the team coming to visit us here, and this is the starting point of building the next great company. Obviously, until we close the deal, we operate as two separate independent companies that are very aligned together, but we will try to get closer. Huang: This is a great milestone for our company, and a milestone for the computer industry. As Eyal said, we have already partnered on so many different projects, from building supercomputers of all kinds, to cloud data centers and enterprise computing centers. We are delighted to be here. Mellanox will be a stand-alone entity here in Israel and we will continue to grow it. Our intention is that every single one of Mellanox’ product lines, Infiniband, Ethernet—we will continue all of that. It is my intention and my hope that Eyal will lead Mellanox Israel, and as we discussed this morning, among the employees, for as long as he shall live. It would be a great honor to build this great company with him. Those are our intentions. We would like to grow this design center. We work with Mellanox in high-performance computing centers, research centers, enterprise data centers. There is no way that we would not continue to invest in this company. That is the reason we decided to acquire Mellanox. I have loved this company for a very long time, as Eyal knows. We have worked together for many years. We have a new building and it is going to be able to house a lot of engineers. We have several hundred partners here in Israel. We work in AI, and Israel is one of the world’s leading centers for AI, whether that be self-driving or software services. We invest in some of them. Our goal, and our hope, is that our partners here in Israel will grow and flourish to become very successful companies. Nvidia is 26 years old, and we rarely make acquisitions. And the reason for that is because we generally like to build, to create new markets and technologies for markets that have never been explored. The stock price went up because people love the story, people love the strategy. Although it wasn’t completely obvious at first, as soon as we explained the importance of data centers, the importance of networking and Nvidia's accelerated computing, the market responded to the strategic synergy that was evident, and the growth synergies that were evident. Waldman: I think that shareholders understand the synergies, the capabilities of Mellanox within Nvidia, autonomous cars and so on. We were very proud to see the street understand the value of Nvidia joining Mellanox. The teams felt excited about the Nvidia stock appreciation. We have to justify it after the agreement closes. The board of directors decided a few things, and Nvidia was one of the natural companies that we thought of with regard to finding a home for Mellanox. We can’t talk too much about what happened behind the scenes, but it was a very good process. Huang: It was incredibly competitive. It was supremely competitive, in fact, bankers will tell you they’ve never seen anything like it. But we had the best final offer, and so we won the great privilege of building this company together. I don’t know what the other guys offered, but I know that my offer was the best one, and that’s all that matters. Eyal is a tough negotiator, my goodness! I had to call him every day to tell him I love him, every day! He was the first person I spoke to in the morning, he was the last person I spoke to at night, and before you knew it after several months it was “I love you, darling.” Now I miss the phone calls. It’s like, good night honey. Sorry honey, I didn’t mean to interrupt you. Waldman: Data is the most important resource on the planet, and we can move it in the fastest, most efficient way. The synergy puts us in a very good competitive position. Huang: Eyal and I both built our companies from scratch. The management team and the leadership team that are here did painstaking work to build this company. The ultimate success of a company is measured by the contributions it makes to the industry and the community, and the impact it makes in their families’ lives. We both feel that way. There are very few companies in high tech who over the course of two decades have maintained leadership and a position and a defined appeal as Mellanox. That’s quite extraordinary. Mellanox within Nvidia is better than Mellanox within NASDAQ. Otherwise, everything else will be the same. We will continue to invest in Israeli technology and startups and help Israeli technology companies to flourish.